News: Why were we gone for so long? Read this for more info. We are now on a new web host, so hopefully, everything will be smooth sailing from here on out. Amidst the chaotic guerrilla warfare of Civil War Missouri, a small force of Union militia troops is tasked with carrying out General Order No. 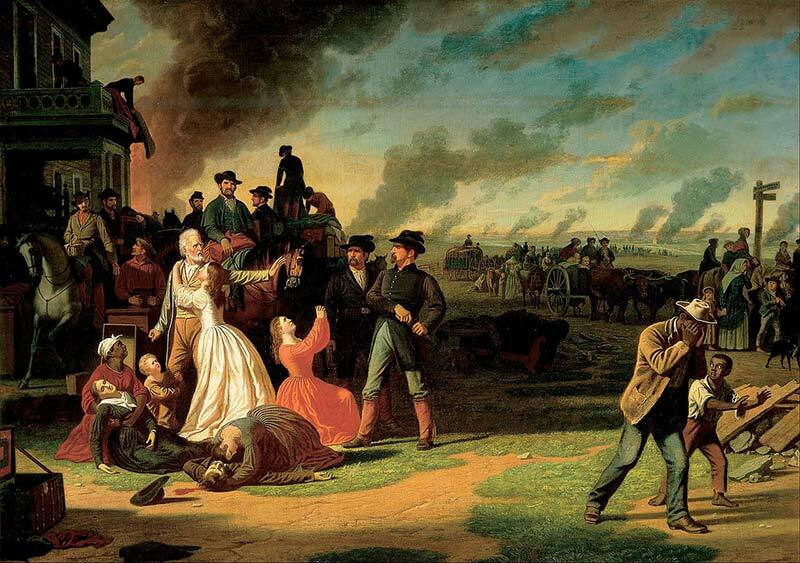 11, the expulsion of all civilians from four counties on the Kansas-Missouri border. But each soldier has his own motivations, not all of them noble. When they encounter some unusual opposition, their commitment to their mission, their unit, and even their sanity will be tested. This is an early playtest version of this scenario, and also Ethan’s first time running Trail of Cthulhu. Whooo first new comment on restored site? On topic: really fun game, enjoyed it a great deal, props to Ethan. I will say, I felt the end felt the shakiest, I feel like either a Glancy style rapid descent into violence and death OR a whole ‘nother session would have served the game better. Always a pleasure to listen to these Civil War games, though. Bring back Lefty and the Cyclops! I have to agree, I too would like to seeLefty and Cyclops return. Also does this mean we’ll see a gumshoe revised version of the amputee list Ethan? That’d be delightful. I liked this session on a spectrum of levels, history and Cthulhu is my favourite (nay the BEST!) way to learn history. Also I’d love to see a dreamlands game expansion of this (must… resist… spoilers…), the NPCs, the scenario and the monsters were just fun all around for me, as was player interaction. Nice scenario with lots of potential to be tightened up vis-a-vis the ruleset and perhaps the pacing at times. This isn’t showing up on my iTunes feed but hopefully that will get squared away soon. Thanks for the kind words! I’ve been working on developing the pacing and the end a lot since I ran this version. I think Ross is right that it works best as a two-parter, or by skipping the first few scenes and beginning when they encounter the family in the woods. And I’ve been working to make the family both more honest and upfront about what they’re doing, as well as a whole lot creepier. Part of the inspiration for the scenario (besides Civil War history and my own family’s history with the Missouri Mormon Wars) was that I was tired of Nodens being the designated Good Guy God in scenarios. In my version, he’s only “good” in comparison to Nyarlathotep. He’s still totally inhuman and uncaring, he just sees humans as convenient tools for fighting his war. So he’s perfectly willing to take some highly impressionable religious folk and turn them into a crazed backwoods cult willing to sacrifice everything to do his will. Not only is there a personal avatar of Nyarlathotep in the guise of a Kansas militia captain, but the prophecy requires that the PCs do *all three* of the sacrifices, instead of choosing one. So the morality of their choice is much more in doubt. That takes dedication. Ethan, sir, you have my utmost respect. Just a technical note. This episode has appeared in my RSS reader through a ‘new item’ trigger… well over 20 times. I’ve lost count really. probably every 15 minutes since it first appeared (it appeared about 8 times in the reader notifier within seconds). I assume its the new host/website not reacting well to my RSS scripts. (I’m also getting timeouts loading the RSS, probably related) could be my script thinks its new compared to a cached version. Not complaining, just a tech note in case there is a problem. If no problem i’ll add an additional filter on the trigger. Great scenario. My only quibble: Mormons don’t consume “hot drinks,” so it’s unlikely that the woman would have offered the PCs tea (or it should have been a sign that something very wrong was happening). Oh, good point, NJC! I’ll have to adjust that detail, maybe play it up to emphasize that the Hakelins broke off before the Word of Wisdom started being taken so seriously by the Mormon authorities. Or maybe that’s why George Sr. was expelled, just before he heard the word of Nodi. Might be a bit of irony in having something so minor open him up to everything else that happened to him. Great episode of some horror back in time. A few thoughts going on the feedback in the back part. Another thing with the wild pigs since they can sense the infection is to have the player characters run across a body of a raider or someone else where there are some wild pigs eating the infected. The pigs killed someone but is only eating the bad parts of the arm of the corpse. Agreed about using some of the red shirt troops to bump up the tension with them going missing or freaking out about their arm, maybe they see their arm infected during a dream & react badly to remembering those dreams or absentmindedly damaging their bad arm. So touching silver is bad for the infected, what about recreating the blood test scene with the Thing? Here’s something rather innocent of getting touched with silver, but with some red shirt freaking out or reacting badly will just create a lot of paranoia to the players or them trying to hide it if they’ve been infected. Those are some good ideas, Darren! Thanks for the feedback. I could especially see that scene from The Thing happening, depending on how the PCs behave. I just ran this scenario for our group at Technical Difficulties (technicaldifficultiespod.com, and it should beposted sometime in the next couple months (we’re posting our entire Red Markets Beta campaign first, to help hype Caleb’s Kickstarter). Or just click on my name. Thoroughly enjoyed the background and adventure idea Ethan. Reminded me of ASG’s Lord of the Peaks in terms of historical detail. As I am not native to the area, I appreciated the integration of local Missouri history, the Civil War and the Mormon’s experiences into the narrative. I do think there is room for some refinement of the adventure, particularly in the structure and plot arc. I’ll have to listen again to provide a detailed opinion. Although it does adds time to the adventure, I strongly suggest that you keep the initial encounter with the normal farmer. All horror works best when contrasted with the real; first grounding the reader in the normal and mundane before stepping across the border into the strange is essential, I think. references you chose created a palpable sense of unease. The sequence of the protagonists meeting the kids chasing a starving hog; then encountering the body bonfire, builds tension well. There is only a hint of the unnatural in the starving hog/kids silver knives encounter. This scene provided an opportunity for the players to connect sympathetically with the cult kids. Then the players encounter the more obviously wrongness of the bonfire. This sequence is setup like a jab, then a solid left hook. The innocent kids truly can’t explain the purpose behind the obvious wrongness, but they provide a direct link to the next scene; one which the players will follow, but follow with caution and dread. When Ross was investigating the silversmith forge you gave him clues about the people who used the forge, their skill and some hints as to their personality. That was fantastic. More games should present the opportunity to tell a story through careful observation of a place. The Souls and Fallout games are great at this. Darren T suggested: “So touching silver is bad for the infected, what about recreating the blood test scene with the Thing?” This is a great idea and could make for a really dramatic scene of wary officers huddled around the forge in the driving rain with a flickering lantern illuminating their bloodied palms slashed by knives. In fact instead of the players coming up with this idea, the infected men might get the bright idea to slash their limbs with silver as a test and then players come across this gruesome and frightful sight. Confusion, horror and guns are drawn; cue Yakety Sax. Ethan, regarding your description of the nightgaunts as “faceless angels” and Nodes and “the Angel Nodi (sp)”; that whole section you narrated was awesome, perfect, and should be included in the adventure word for word. Question: What was dripping the taint from the forest canopy onto the victims’ limbs? If the progenitor of the taint is a new element to the forest (as was suggested when the cultist who died in the civil war wrote about the end times to his brother), there could be some physical evidence of something unnatural entering the forest recently that the party could encounter on the way to meet the cultists’ homes. Suggestion: You alluded to limb amputation with the Civil War surgeon premade PC. Perhaps bring that theme more front and center in the adventure? Perhaps the party comes across a buried hospital and there is evidence a pile of limbs wriggled off? You may also want to reference Herbert West: Reanimator in the first or second acts in style/theme to catch the Lovecraftian scholar players off guard. The biggest “problem” I see, is that the party starts off with 10-15 NPC soldier “redshirts” under their command. This makes sense from a historical perspective and is wholly thematic that way. However, isolation is one of the central tenants of creating fear in players. Having a large number of NPC redshirts to order around takes away that fear. There has to be a narrative purpose for having that many redshirts around and trying to keep them alive. -Some redshirts are first casualties of the taint dripping from the forest canopy (you did this). How many should be infected? Do they suddenly turn on their fellows in mutiny (unlike infected PCs)? -The Endgame involves storming a horrible Avatar of Nyarty. Does the success of the endgame depend on a number of stalwart soldiers? For example if half of the redshirt soldiers are lost, would the players be required to make several persuade rolls to convince the cultists (or even the normal farmer) to join them to make a suicide run successful? -Are the redshirts there to take casualties if the party decides to lay siege to the cultists homes (ie redshirts are killed in traps)? You should also expect some types of players to see redshirts as (what they are) an army to make brute force the simple and easy answer to all questions. The adventure should have some contingency plan for what happens when some doofus player orders the redshirts to fire on the cultists first and ask questions later. Or to take over the normal farmer’s farm and try to sidestep the adventure. Good adventure, hope this helps. Great podcast guys, I really like the vibe around your table! I was listening to this episode whilst out running …. through some woods …. at dusk …. while it was windy …. and things kept dropping on me from above! Thanks, Antman! A recording of a newer version of this scenario is going to drop on our new podcast, Technical Difficulties, pretty soon! We NEED photos of the handouts! I’m loving this! Ratcheting the creep factor up to 11. Thank, Toby! I don’t have photos of the handouts, unfortunately, BUT there is a two-session version of this same scenario on Technical Difficulties, filled with revisions that I made after this RPPR run! As for the hand outs — well, I’ve got to save something for the eventual published version, don’t I?